It was a case of survival of the fittest at St Neots Regatta 2018, as strong winds and heavy rain made conditions extremely difficult. Racing had to be suspended at one point when a large tent was blown on to the river, but plenty of rowers showed grit and class to produce superb performances. St Neots enjoyed two victories and four runner-up spots over the weekend. Ali Brown and Helen Knowles stormed to victory in the women’s masters E/F double sculls over Sunday’s 500m course – repeating their success from the previous year. They progressed to the final after their semi-final opponents pulled out, and never looked back as they romped home against a crew from Oundle. Etilly Pigg was also celebrating on the Sunday after a convincing win in the women’s junior 16 single sculls category. Strong rowing throughout the day saw her ease to wins over opponents from Broxbourne, Oundle and, in the final, Nottingham. Other St Neots rowers just missing out on silverware were Adam Williams, who lost by three quarters of a length in Sunday’s open single sculls (band one) category, and Alex Johnson and Dom Holdaway, who lost by the same margin in Sunday’s junior 17 double sculls event. On the Saturday, racing over a 1,000m course, Anna Shreeves progressed to the final of the women’s single sculls (band one), but couldn’t overhaul her strong opponent from Isle of Ely. Ali Brown and Helen Knowles attempted a second win when they teamed up with Lynne Taylor, Marlene Taylor and cox Deb Hellett for Saturday’s women’s masters C/D/E coxed fours; they cruised through their semi-final, but lost by about two lengths in the final against a Milton Keynes crew. The regatta attracted more than 1,000 rowers from 51 clubs all over the UK, all keen to take part in one of the largest and most popular events on the rowing calendar. 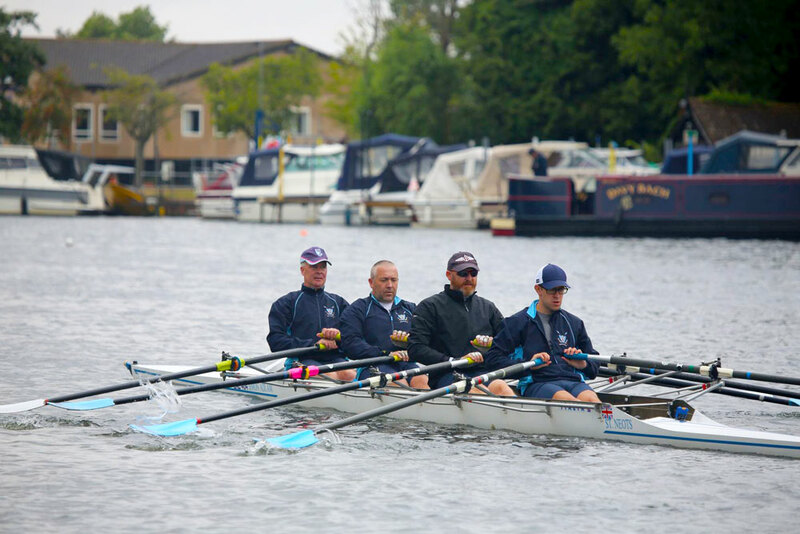 “Well done to all the competitors who battled horrid conditions over much of the weekend,” said Trevor Rickwood, St Neots Rowing Club chairman. “The weather didn’t dampen their spirits, and lots of people congratulated us for the way we managed to keep such a great event going despite the wind and rain. Open coxless quads (band two): Nick Shorten, Andrew Lawrence, Stuart Williams and Richard Gray were beaten in their semi-final by Norwich. Junior 17 double sculls: Dom Holdaway and Alex Johnson lost in the first round against Boston. Open single sculls (band one): Will Todd lost in the first round against Huntingdon’s Josh Davies. Open coxless quads (band two): Karl Zwetsloot, Kieron Marriner, Pip Wright and Rob Stirling lost their semi-final against Nottingham. Open pairs: Mick Staddon and Stuart Williams lost in the first round against Bedford. Women’s junior 17 double sculls: Emily Jupe and Juliet Moutel-Davesne lost their semi-final against Deben. Women’s single sculls (band one): Anna Shreeves lost in the first round against Devil’s Elbow. Women’s single sculls (band two): Sarah Leatham lost in the first round against Oundle – but deserves huge credit for racing in a single at her first-ever regatta. This year’s event included tributes to two of St Neots Rowing Club’s longest-serving and most valued members who recently passed away: Eileen Davies and Chris Leaf. Saturday’s women’s coxed fours category (band one) was dedicated to Eileen, and was won by a crew from Northampton Rowing Club – a fitting result given that Eileen was a former member and captain at Northampton. Saturday’s open coxed fours category (band two) was dedicated to Chris, and was won by a crew from Lea Rowing Club. Bespoke awards were presented to the winners in each category by Eileen’s husband, and club president, Robin Davies.